PATHWAY OF PEACE: Iroquois Thanksgiving Address "Sustains the Earth"
Iroquois Thanksgiving Address "Sustains the Earth"
In fond memory of Chief Leon Shanandoah and Chief Jake Swamp...my friends and mentors. 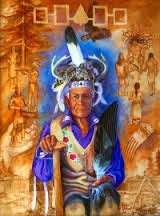 Former Wolf Clan sub-chief of the Kanienkehaka (People of the Flint), Mohawk Nation. For more than thirty years Jake Swamp had been a Mohawk sub-Chief and representative of the Haudenosaunee, Iroquois Confederacy which is comprised of the Mohawk, Oneida, Onondaga, Cayuga, Seneca and Tuscarora Nations. He has presented the wide range of his experience in indigenous, environmental and social issues in talks and programs both locally and internationally. Jake Swamp founded the Tree of Peace Society in an effort to address current topics in environmental and cultural education. The Tree of Peace Society builds cross-cultural understanding between Native and non-Native people, promotes environmental and social ethics, and works tirelessly to preserve the culture and languages of the Haudenosaunee. wishing everyone a Blessed Thanksgiving Day...may we give thanks everyday.. It is nearly Thanksgiving in the U.S., marking the official beginning of the holiday season. Know that in this unique time of the year there is an awakening in you of the spirit of Gratitude. It is the true essence of Thanksgiving. When you can immerse yourself in the flow of pure Gratitude, it catalyzes new abundance in every area of your life. Gratitude can provide a new containment field for your heart to open into. It is a true gift for yourself when you live in Gratitude. The power of giving thanks can help to lift you above the appearance of disharmony so that a new life emerges within you, opening doors to amazing possibilities you never imagined.